A rogue protein involved in Parkinson’s disease that wrecks catastrophic damage has been tracked down by researchers in work that could help find a new possible treatment for the disease. The researchers published their findings in the journal Science. Virginia Lee, a neurobiologist at the University of Pennsylvania in Philadelphia, and her team a misfolded synthetic version of the protein α-synuclein into the brains of normal mice and saw the key characteristics of Parkinson’s disease develop and progressively worsen. The study suggests that the disease is spread from one nerve cell to another by the malformed protein, rather than arising spontaneously in cells. Back in 2008, when transplants of fetal nerve tissue given to patients with Parkinson’s developed the characteristic clumps associated with the condition, it was hypothesized that the disease might be spread from neuron to neuron. The nearby diseased cells had somehow infected the transplanted tissue. 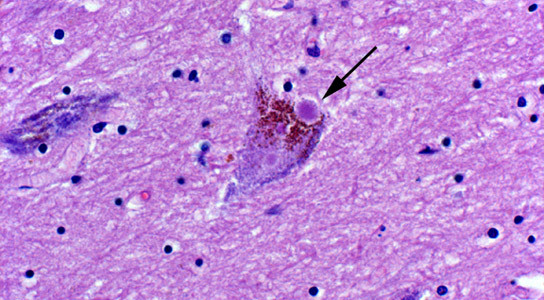 Subsequent studies have shown that misfolded α-synuclein can spread to neighboring cells and cause cell death. It still remained an open question whether this transfer played a significant role in the disease, states Tim Greenamyre, director of the Pittsburgh Institute for Neurodegenerative Diseases in Pennsylvania. There are two distinct features in Parkinson’s: clumps of protein called Lewy bodies and a traumatic loss of nerve cells that produce the chemical messenger dopamine. When Lee’s team injected the misfolded α-synuclein into a part of the mouse brain rich in dopamine-producing cells, Lewy bodies began to form. This was followed by the death of dopamine neurons. Nerve cells that linked to those near the injection sites also developed Lewy bodies, a sign that cell-to-cell transmission was taking place. The study lends theoretical support to the biotechnology companies that are sponsoring clinical trials of α-synuclein antibodies for Parksinson’s, states Eliezer Masliah, a neuroscientist at the University of California, San Diego. It should also spur research on how the protein gets in and out of cells. There is still no clear explanation as to why Lewy bodies appear in the first place. 1 Comment on "Link Between Cell Death & Protein Clumps Could Lead to Possible Treatment for Parkinson’s"
α-synuclein protein in the brain cells gets misfolded unfortunately to produce Parkinson’s disease which causes the death of dopamine producing nerve cells. Antibodies to arrest the α-synuclein protein is a good job. The misfolding of α-synuclein gets spread to other neurons also, thereby causing the death of dopamine producing cells one by one. In both Alzheimerism and Parkinsonism it is the protein natural,which plays villain in the body. The proteins are made for one specific function like PrPc in the cell membrane for adhesive purpose of the cell wall and α-synuclein for a specific purpose. But misfolding of proteins, when cell chaperones doing the folding job is careless and misfolds the protein itself becomes a villain and also like how a virus does, it spreads to other cells too and corrupts normal folding of proteins there to misfold and cause havoc. Thank You.